Don't Call Him "Little Tex"
If you call him “Lil’ Tex,” the lawyers for the Texas State Fair will come swooping down with a cease and desist order. That’s why the 22-foot cowboy who stands near the intersection of FM 1417 and Plainview Road goes by an alias even though his resemblance to his more famous cousin is striking. We’ll just call him Sandblasting Man, as his day job is to draw attention to Jay Goode’s Big Cowboy Custom Sandblasting in Sherman. Sandblasting Man is not an only child. 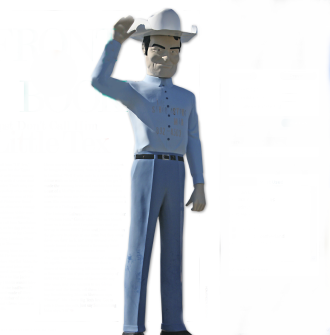 He has three brothers, Cowboy Muffler Man, the twins, John and John, and a sister named Uniroyal® Gal, who looks a lot like Jackie Kennedy-Onasis would have looked—if she had been 17-feet tall and made of fiberglass. The father of the clan is Jay’s dad, Glenn Goode of Gainesville. Glenn started his unusual family in 1971 when he bought a big cowboy from a go-cart track in Garland. Well, it was near to a cowboy as a statue with no head, hands and feet can get. “I made the missing head and cowboy hat from a cast of a Muffler man in Canton,” he told an interviewer from the Web site roadsideamerica.com. The hands came from a mold taken from a statue at a Dallas muffler shop. “The Uniroyal Gal was bought from a car dealer in Wichita Falls,” Goode said. “She was blown down in a storm, and I repaired her and put her up in about 1984.” John and John worked in the grocery business at one time, but they were down on their luck, just lying around when Goode found them behind a Kentucky bowling alley and brought them to Texas. There is a large map of Grayson County set into the floor just inside the main entrance of the courthouse in Sherman. The county’s boundries—Fannin County to the east, Collin to the south, Denton to the southwest, Cooke to the west, and the Red River and Oklahoma to the north—are delineated by dark strips of metal, and the four county precincts that existed at the time the courthouse was built in the 1930s are shown in different colored stones.